This page is where Mountbatten users share their stories with us. Come back often to read new stories, and if you would like us to add your story, please use the links on the Contact page. Our first stories are from families, and then from teachers and finally from the children themselves. Teachers around the world love to have Mountbatten in their classroom, as the many calls and emails over the years attest. But the most telling evidence is not anecdotal but the result of a study done in Canada. This article (click to read the pdf) describes the perceptions of teachers of students with visual impairments regarding the impact of the Mountbatten Brailler, used in a literacy instruction project in British Columbia, on the development of students’ reading and writing skills, basic computer skills, and Braille note-taking skills and the students’ interaction with peers and classroom teachers. Teachers are so excited about their students working with the Mountbatten that they share their experiences in the following video clips. Both of these clips are posted on YouTube. 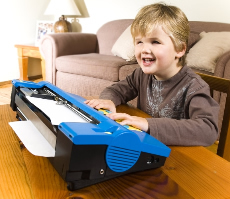 Mountbatten brailler is great for young children to learn Braille. Many teachers and families know and understand the importance of Braille literacy. They see the potential of the Mountbatten in supporting young learners in mastering Braille. Russell Hinderman who is a happy winner of the Braille Literacy Contest is using the MountBatten Learning System from HumanWare. Check out how Mason integrates multiple technologies to be successful in school. Thanks to the Mountbatten Brailler tactile medium will become one of his ways to interact with information. Mountbatten Brailler to Conquer the World! Click to read all about about Sarah and Lucas and their trials and tribulations on the way to getting the Mountbatten. My partner Darren, 27, and I stared at each other, aghast. Sebastian, our first child, was just a month old. – How did it happen? – Darren croaked. – Sebastian’s optic nerve hasn’t developed fully, – the doctor explained. – It isn’t inherited. Has no known cause, and no cure. – What will we do? – I asked Darren in tears. – We’ll deal with it – together. We have to stay strong for Sebastian, – he said. But it was so hard. Every time I thought of how our son would grow up without ever seeing the sky, the ocean, or us, I’d break down in tears. When he was six months old, a school with a special unit for the blind and visually impaired asked me if I’d be interested in learning Braille to help home one day. So I started taking lessons, but it wasn’t easy ‚reading’ through my fingertips. It was so hard to tell the difference between the raised dots. But I persevered – and at home, I learnt other things. I leant that Sebastian loved musical toys, that I had to clap my hands so he’d know where I was, and that noisy places overwhelmed him. Our families helped out as much as they could. My friend Jodie helped me stay positive, too. – His blindness won’t stop him doing anything he sets his mind to, – she said. She was proved right when, at 15 months old, Sebastian took his first steps. – Good boy!’ – I cried, kissing him tearfully. Soon after, Darren and I got married – and then I learnt I was pregnant again. – What if this baby is blind, too? – I asked Darren, worried. Thankfully, Toby was both in October 2003 with no vision problems. By now, Sebastian was two and learning how to read the alphabet in Braille. 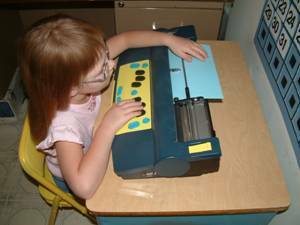 But we had now way of writing it ourselves, so I was thrilled when the school lent us an old Braille machine. At three, Sebastian started attending an early intervention program at a local school to learn how to interact with other children. He also started going to kindy two days a week. After a few sessions, he marched up to me. – Mummy, I’m blind, – he announced. – The other children told me. – I know darling, – I said, choked up. – But what does it mean Mummy? – he asked. I explained that he couldn’t see like other kids, but that being blind wouldn’t stop him from being the best he could be. – And your daddy and I both love you very much, – I added, hugging him. By now Darren and I were still learning Braille using the old-fashioned machine, but its keys were just too heavy for Sebastian’s little hands. – What will we do? – I said to Darren. – Being able to read will really help his progress. – I don’t know, – he sighed. Then just after Sebastian’s fourth birthday, we were told about a new Aussie machine called a Mountbatten. – It’s much easier to use than the machine you’ve got now, – his Braille teacher explained. – It’s light and quick, can be connected to a PC, and it has voice synthesisers, so it can translate Braille into speech. – Sebastian will learn to read much more quickly than he can with the old machine. It sounded fantastic. But the price tag – nearly $5000 – was way beyond our reach. – Why don’t was ask some local charity and community groups if they could help out? – his teacher suggested. – Do you think they would? – I asked, surprised. – It doesn’t hurt to ask. So I composed letters to Rotary, the Lions Club, and local community groups Apex and Zonta. If you could help, it would make so much difference to all our lives… I wrote. Then I posted the letters and crossed my fingers. I didn’t have to wait long. The four groups decided to donate $1000 each. When Darren’s workmates at Simplicity, the local air-seeder factory, heard about the donations, they did a collection and raised over $1600 – more than enough to cover the balance. We were overwhelmed by everyone’s generosity. Now we’ve ordered the Mountbatten and we’re counting down the days until we receive it. Words can’t express our gratitude to everyone for helping our son. The machine won’t help him see but it will help him read – and that’s a whole new world to explore. It’s more than a machine to us – it’s a little piece of magic. True story as told to Joanne Atkinson. Shyanne is a bright happy six year old girl from a small town in eastern Virginia, and the youngest of seven children (4 girls and 3 boys). Like her father and eight year old sister, Shyanne was born with congenital cataracts. At ten days old she underwent her first cataract surgery on her right eye and her left eye was done just two weeks later. Unfortunately soon after her cataracts were removed she developed glaucoma. Glaucoma is somewhat difficult to treat in infants, and as a result Shyanne has undergone 30 surgical procedures to date to try and control her glaucoma. After one procedure an infection developed in her right eye. The infection destroyed the retina and left her with no sight in the eye. Her left eye, which was once her weaker eye, is now her only eye with sight, and it is estimated to be around 20/200. She has started kindergarten this year and with the aide of a Mountbatten Brailler she is well on her way to learning Braille and a great future. Shyanne enjoys using her Mountbatten. The speech function makes it seem like she has a friend instead of a machine. She especially likes the Australian accent. Shyanne has tried to use other Braille tools like the Perkins, but with her tiny fingers and small arms it is very difficult for her just to press the buttons. The Mountbatten requires very little strength to press the buttons and keys are slightly closer together making it even easier for those little fingers. Since the Mountbatten embosses when the keys are released it is great for someone just learning Braille. You can depress one key at a time until you have the right combination for the desired letter and when you release the keys your letter is embossed. We have found this especially helpful with contracted Braille. 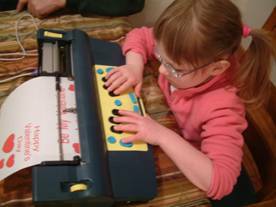 Shyanne has used her Mountbatten for many things and we are always trying new ways to keep her wanting to spend time using it and developing her Braille skills. 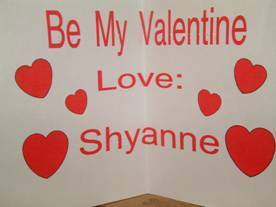 This February Shyanne used the Mountbatten to add Braille to her Valentine cards. Everyone who received these cards was very excited to feel the Braille. For some it was the first time they got a sample of what Shyanne’s life is like. We have also come up with some fun games to play using the Mountbatten. One game Shyanne really likes is called Match Maker. In this game Shyanne uses her Mountbatten and someone else uses a QWERTY keyboard connected to the Mountbatten’s PS2 port. 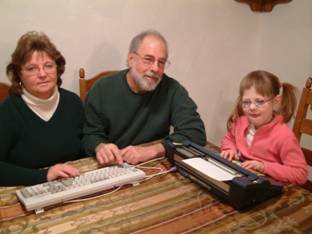 The person(s) using the QWERTY keyboard must type a letter or word and Shyanne must match what they have typed using the Braille keyboard on the Mountbatten. This game is great because it can increase in difficulty as Shyanne’s Braille skills increase. Simply start with one letter at a time. Then increase to multiple letters or words. Next you can do an entire line. It is also great to teach the tactile feel of Braille letters. Turn off the speech function on the Mountbatten and create Braille using the QWERTY keyboard. 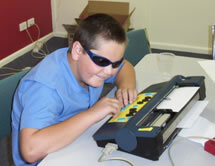 Then have the person learning Braille feel the characters and match them using the Braille keyboard on the Mountbatten. Shyanne’s Mountbatten was purchased by our local Lions Club. The club asked us if we would like some assistance in acquiring any aides or materials to help Shyanne. We saw a Mountbatten at a vision teacher’s conference we had attended in the spring and knew it would be the perfect tool to help Shyanne learn and use Braille. The Lions club was great help in putting together the fundraising project. 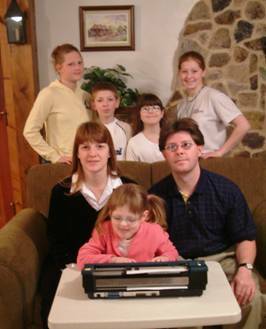 They set up a fund called the Shyanne Fund and created a web page using a company called Active Giving (www.activegiving.com) and linked it to the Lions Club website (www.strasburglions.org). This allowed people to make secure online tax deductible donations. The local newspaper was contacted and wrote a wonderful story about Shyanne to promote the website and generate interest for the Shyanne Fund. A local radio station also let us come on the air and tell Shyanne’s story during their morning drive time show. Word spread fast and with incredible support from our community we raised over $9000.00 in just over sixty days. This allowed us to purchase the Mountbatten Pro Brailler and a CCTV system for Shyanne as well. The Mountbatten is a wonderful aide for any low vision or blind person. It is particularly great for young students. 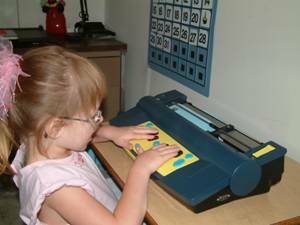 Shyanne was becoming frustrated with other Braille devices she had tried to use and when she received her Mountbatten and switched it on she was so excited. When she heard it say Good Day in an Australian voice she started shouting “It talks! It talks!” Because the Mountbatten has so many basic and advanced features it will be a predominant tool that will aide Shyanne in her academic career well into her high school years. It is also rugged and durable and with the rechargeable battery she can use it anywhere. The Mountbatten can be accessed with a QWERTY keyboard or a PC with word processing software so that anyone can produce Braille. The Mountbatten can also back translate to a PC allowing a blind user to produce regular printed documents to be handed in to a teacher at school or a report for work. 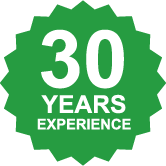 It is a remarkable device and we encourage any parents or teachers with a low vision or blind child to seriously consider the Mountbatten for their child. We could not be more pleased with ours. I like my Mountbatten because it is fun. I like to type letters with it. It is funny when it talks. It is easy to turn on and I can use it by myself. I like to take it to school and grandmas house. Written by Justin Dunn, as a submission for the Australian Braille Authority, NSW Sub-Committee, Braille Writing Competition 2004. This is how Braille literacy has changed my life. It started off like this. Before I came to school I was writing print, so I had no idea what I was writing about. Until my mum could tell me, no one could read it because I was so bad a writer. I could not read. When I was not even two people like Mum, Dad Grandpa and Nan would read to me. My favourite was Thomas. I would be read to about seven times a week so that I could talk to make up for my sightless eyes. When I went to preschool I had books with tactile things in them, but no writing. In Kindergarten I had my own flashcards so I could read them when the others did theirs. I still have them and still look at them. I loved doing art then, and I still do, but back then I was not very good at it. I would play with my Braille, but most of the time I would have to practice my Braille skills. I had a lot to learn about Braille. We had places to put our bags, and I had Braille where my spot was. In Year 1 I had a new lot of flash cards but they were there for the same reason. I learnt new things to do with braille. I did not sit in the classroom to do my work because of the noise involved. I sat in a room outside the classroom. My teacher was Mrs Storey. I had a rock thrown through a window above the Brailler and I could not use it because it was full of glass and rock. So I had to wait for the rock and glass to be taken out so I could use it again. Having no Brailler did not improve my Braille. In Year 2 I heard the story of Louis Braille, how he worked to make dotted letters and how he went blind. He had no success in making dots Braille because the school staff burnt his books when he went home for a holiday. But all of the other kids liked his idea. When he got older he became a teacher there, and taught the dotted Braille to other blind kids. And that is the story of Louis Braille. Year 2 was the first year I had a Braille chart. It was a sticker chart. Year 3 was the year that I had my first project. It was a school project but still was a project. It was on The Lion, The Witch and the Wardrobe. Braille helped me then because I could read the book with the other kids. Also it was good that year because I put Brailled names on all the other kids trays so that when the teacher said, „Put this in Alex’s tray,” I could do that. I also started TTAPS Touch Typing At Primary School. Putting Braille on the keyboard helped me learn where the letters were, and I don’t need them any more. In Year 4 I had my first project to take home. It was a hard one on Australia. I wrote Braille letters and someone put them in print for me so that the wool and other corporation could read them. Then later that year I did one on continents. It was not as hard as the one I did the year before, but still hard. I started timed reading in Year 4. This was to make me get better and faster at reading. As we went on, my reading became much better than it was before. In Year 5, the year that I am in now, I have had one more project in term 1 and am doing another one at the moment. I am now 10 years old and turning 11 this year. As the years go on I have got better at reading and writing. And it became fun. I have learnt lots. Braille has changed my life because of a lot of things, but the best that it has changed my life with is board games, such as Monopoly, Ludo and Uno. The games I have are fun and enjoyable. My Braille games have Braille rules, and Braille on them, with lines and dots to show where to go. Braille dice are also included and a normal dice as well. If it was not for Braille, people could cheat in cards. I could put the wrong video on – it could be anything without the labelling. I am thankful for Braille literacy. It is amazing what people can do with Braille. It is amazing what Braille can do and how Braillers have changed, from dot pushers to hand frame and stylus, to Perkins Braillers, to Mountbatten Braillers. That is how Braille literacy has changed my life.